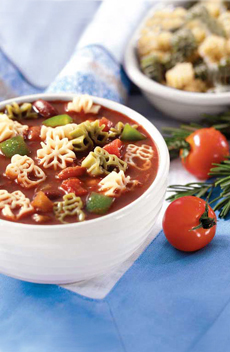 Novelty pasta shapes can spruce up any lunch or dinner. See our review of Pasta Shoppe, a NIBBLE Top Pick Of The Week. If you enjoy this Pasta Glossary, we have a food glossary for almost every category of food, including Italian favorites like cheese, espresso and olive oil. Plus, find reviews of our favorite brands of pasta and sauces, pasta recipes and informative articles about pasta in our Pasta Section. 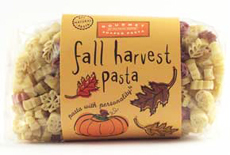 Semolina-and-water pasta without eggs (see FDA definition of macaroni products below). Many macaronis are tube-shaped, but there are other forms including shells, twists and ribbons. 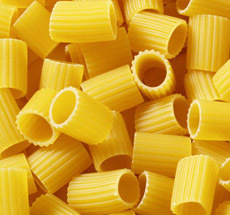 Among the best-known tube shapes are: elbow (a short, curved tube), ditalini (tiny, very short tubes), mostaccioli (large, 2-inch-long tubes cut on the diagonal, with a ridged or plain surface), penne (large, straight tubes cut on the diagonal), rigatoni (short, grooved tubes) and ziti (long, thin tubes). Most macaronis almost double in size during cooking. The Italian spelling of the word is maccheroni. As classified by the FDA, these are the class of food, including spaghetti and vermicelli, which is prepared by drying formed units of dough made from semolina, durum flour, farina, flour or any combination of two or more of these, with water and with or without one or more optional ingredients specified. See also noodle products. The Italian spelling of macaroni. A torchio is a press, and these strips of pasta are pressed into attractive curls. A popular preparation is to serve them with “con pomodoro e rucola,” tomato and arugula. Make the sauce by combining 4 cloves of garlic, 1/4 cup extra virgin olive oil, 7 ounces of diced tomatoes (preferably San Marzano tomatoes) and 7 ounces of arugula in a sauté pan. Cook slowly, mashing the ingredients together with a fork. The maccheroni al torchio shown at left are made by artisan pasta maker Rustichella d’Abruzzo, and can be purchased from SalumeriaItalia.com. Maccheroni al torchio. Photo courtesy Pastazanini.it. These are half-inch-long ridged Sardinian pastas that look a like like small worms. They also are known on the island of Sardinia as gnochetti sardi or gnocchi, though they are nothing like actual gnocchi (see gnocchi description). This cut is absolutely delicious, in part due to the wonderful chewy texture of the tightly-rolled shape, and in part due to the aesthetic of the beautiful rolled and ridged appearance. You can purchase it on Amazon.com. Malloreddus pasta looks like small worms. The kids should love them! Photo by Brian Van Sise | THE NIBBLE. A stuffed, baked pasta manicotti (mah-nih-CUT-tee) means “muffs” or “sleeves” in Italian. The large, tube-shaped noodles are about four inches long, and one inch in diameter. One of the oldest forms of pasta, in ancient times the dough was cut into large rectangles, filled with flavorful stuffings, then rolled and baked in the oven (what today is known as cannelloni). Today, pre-shaped tubes are boiled, then stuffed with a meat, cheese or seafood mixture, covered with a sauce and baked. A mixture of two pasta shapes, orecchiette, ear-shaped pasta, and cavaturi, a short rolled pasta (mah-rih-TAH-tee). See also orecchiette maritate. 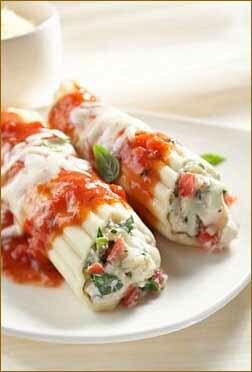 Manicotti, a popular stuffed tube pasta. Photo courtesy DairyMax. The single form of the word is mezzaluna; the word means, literally, “half moon.” Mezzalune are crescent-shaped stuffed pasta. 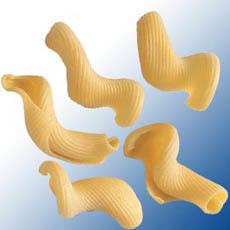 This shape of pillow pasta tends to be small. Typically, mezzaluna pasta uses egg pasta, which is rolled out and then cut with a small die into circular shapes. Any filling can be used. A dab of filling is placed on each circle and the circles are folded over and crimped to seal. The maker must ensure that it is not overloaded. The word mezzaluna also refers to a hand chopping tool, with the blades in the shape of a half moon. 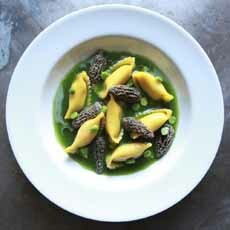 Cheese-stuffed mezzalune with morel mushrooms in a sauce and garnish of fresh green peas. Photo courtesy The Pines | NYC. Literally, “half rigatoni,” a shorter version of rigatoni, this cut is a versatile pasta shape, combining the heartiness of traditional rigatoni with a fun, smaller size (see photo at right). 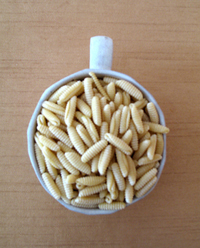 Small, short tubed pasta, generally used in soups. Mezzi rigatoni: half the length. Photo courtesy Barilla.us. WANT TO COOK PASTA PERFECTLY? Mostaccioli (must-a-CHO-lee), literally “small moustaches,” are a specialty of the Campania region of southern Italy, which includes the cities of Capri, Naples and Sorrento. 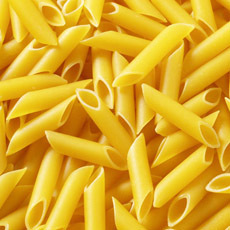 Large, 2-inch-long tubular pasta, they are cut on the diagonal (slanted or angled ends), with a plain surface, similar to regular penne. Both are designed for chunky tomato, meat and cream sauces. Mostaccioli, small moustaches. Photo courtesy Barilla.us. From the German word “nudel” meaning paste with egg. 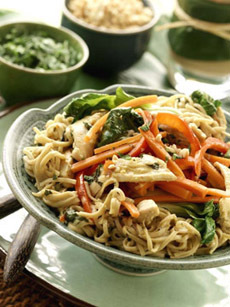 In America, the term refers to egg noodles as well as Asian forms of pasta. Noodles can be made of wheat, rice, soybean, potato, or other flours like oat; sweet potato or arrowroot starch; bean curd skin and tofu; and mung bean threads. Italian pasta (the word means “paste,” referring to the paste of flour and water from which it is made) is always made from durum wheat flour. Dumplings, including Polish pierogi and Italian gnocchi, and German spaetzle, are also considered forms of pasta. According to the FDA, the class of food which is prepared by drying formed units of dough made with semolina, durum flour, farina flour (or any combination of two or more of these) with liquid eggs, frozen eggs, dried eggs, egg yolks, frozen yolks, dried yolks (or any combination of two or more of these), with or without water and with or without one or more of the optional ingredients specified. By law, egg noodle products must contain 5.5% egg solids by weight. Pasta made in shapes reflecting everyday items, cultural icons, logos, etc. Shapes are available that celebrate seasons (leaves, sun, pumpkins), holidays (Santa, ghosts, hearts), hobbies (pets, sports equipment), flora and fauna. For inspiration, read our review of Pasta Shoppe novelty pastas (shown in photo at left and at the top of the page). Literally, “eyes of the wolf,” large, square-cut penne-like pasta (OH-key dee LOO-poe). Generally, this cut is paired with tomato or cream sauces. Literally “little ears,” the Italian, word for ear is orecchio. Orecchiette are one of the three traditional cuts from the Puglia region (along with cavatelli and cavaturi). Orecchiette (oh-reh-KYEH-tay) work well with chunky meat and vegetable sauces. 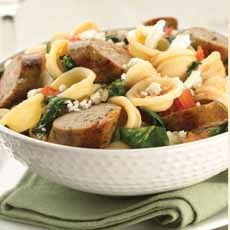 Orecchiette, ear-shaped pasta, combined above with sausage chunks. Photo courtesy Alfresco Pasta. Literally “married” orecchiette, a Pugliese blend of the round orecchiette and the long, thin casarecci, which consummate their “marriage” in the pot when cooked together. Orzo, the Italian word for barley, is a small, 1/3-inch long pasta shaped like a grain of barley or rice; it is made from semolina. In addition to plain semolina orzo, varieties are available flavored with black bean, red chile and sweet potato, among other varieties. Orzo is frequently used as a substitute for rice and can be combined with rice to make pilafs. It is a versatile ingredient and can be used like rice or barley in soups, salads, sides, etc. 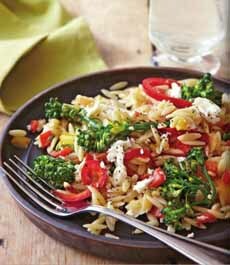 Orzo, rice-shaped pasta, here with btoccolini and red bell peppers. Photo courtesy Melissa’s.